Telstra has said it is ceasing sales of Telstra-branded ZTE mobile and mobile broadband devices throughout its stores and partners following a move by the United States Government banning US firms from supplying the Chinese device maker with components and technology. Australia’s largest telco said that the US Government’s denial order, which was issued last month and prohibits US companies from selling device components and software to ZTE, now prevents ZTE from manufacturing devices for Telstra’s range. 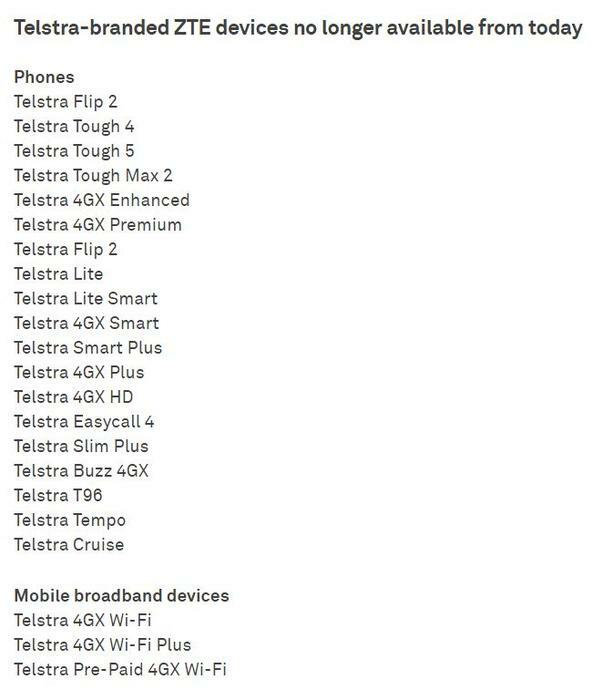 “This was a difficult but necessary decision given ZTE’s decision to cease major operating activities and we apologise that this will result in a temporary reduction in device options for customers,” Telstra consumer and small business head of innovation, product innovation and strategy Michelle Garra said in a blog post on 10 May. “We are working with our device partners to source alternative models as quickly as possible to help meet the needs of customers. We want to make sure any device we offer customers is available through all of our stores,” she said. Garra stressed that Telstra remains hopeful ZTE will be able to reach a resolution to the matter with the US Government soon, so that the telco can recommence selling Telstra-branded ZTE devices. “We want to make sure our customers who already own Telstra-branded ZTE devices are looked after,” she said. At the same time, Garra said that Telstra will contact affected customers directly to let them know that there is no immediate impact to their phone or mobile broadband device arising from the issues with ZTE, and that they can continue to use it as usual. “We will also assure them that should this change we will contact them to step them through their options,” she said. The announcement from Telstra comes as ZTE’s main business operations cease, due to the ban imposed by the US Government. However, ZTE is trying to have the ban modified or reversed. The ban by the US Government against US companies selling tech to ZTE, China's second biggest telecom equipment maker, came after it was found to have violated US export restrictions by illegally shipping goods to Iran.